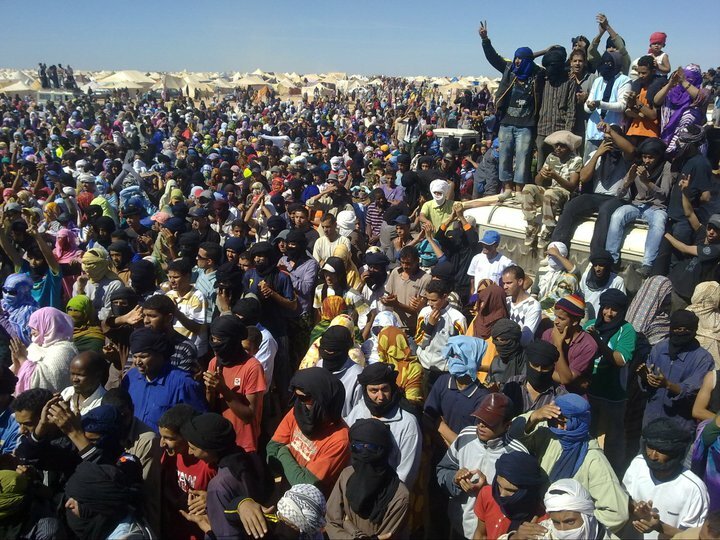 The Gdeim Izik protests started in October 2010 when approximately 5000 Saharawi citizens set up temporary “Camps of Justice” to protest the Moroccan occupation and abuses, and peacefully assert independence. The number soon rose to 15,000 and the United Nations estimated that, at its peak, the camp may have held up to 6,600 tents. The Kingdom of Morocco responded with a violent crackdown on the protesters. Soldiers surrounded the camps in an effort to prohibit food, water and medicine. 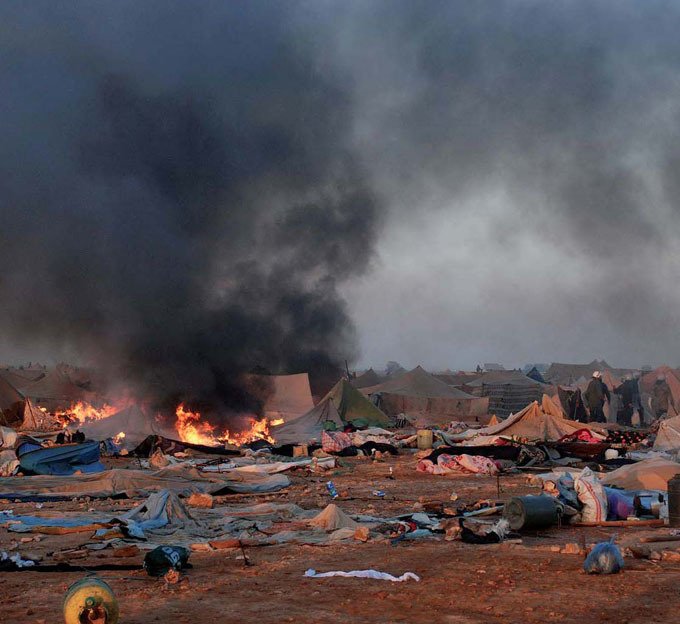 One month later, the camp was dismantled by Moroccan police and 3000 arrests were made. One of the lesser-known independence movements in the world, Western Sahara experienced Spanish colonization in the late 19th century. The territory was partitioned into neighboring Morocco and Mauritania in 1976, after Spain exited. Mauritania withdrew three years later. Since then, there has been an ongoing conflict between Western Sahara’s governing body, the Polisario Front, and Moroccan forces. It has been over twenty years since the UN-sponsored ceasefire of 1991, which promised a referendum on self-determination that is yet to be carried out. This month, Fatma El-Mehdi, Secretary General of the Sahrawi National Union of Women, came to New York from the Sahrawi refugee camps in Tindouf, Algeria, as a representative of the Pan-African association Women Advancement for Economic Leadership Empowerment (WAELE) to attend the Fifty-sixth Commission on the Status of Women held at the UN. This was an historic occasion for Western Sahara, the first time a Sahrawi representative was scheduled to attend an international conference at the UN. El-Mehdi was only seven years old in 1975 when the conflict entered her life. She was evacuated as planes dropped bombs on the city of El Aaiún. After days spent walking with a small group of men and women without food or water, the young girl found herself in one the first Sahrawi refugee camps. She has spent her entire life in the camps. El-Mehdi is now a tireless and dedicated activist defending women’s rights and human rights, and forging various cultural and leadership initiatives not just in the Sahrawi refugee camps, but also in the broader African community. 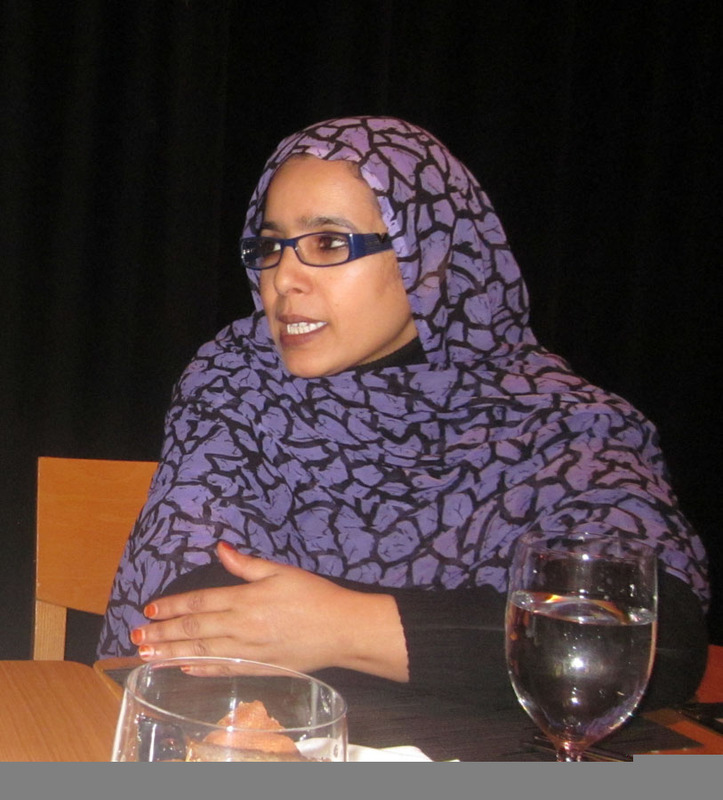 I met her briefly in New York to discuss the history and politics of Western Sahara, the struggles that lay ahead, the role of women in pursuing these and the deep emotional toll the conflict has taken on her family. Bhakti Shringarpure: It is a momentous occasion that you are here in New York to attend the Fifty-sixth Commission on the Status of Women held at the UN. However you were not able to go. What happened? Fatma El-Mehdi: As you know, our republic is not yet recognized by the United Nations. We are still in the process of getting our independence as a nation-state. When we heard about the UN’s conference on women, we wanted to participate because it is a space for women from all over the world. We also thought that it would be a very important occasion to talk about our reality and our experiences as women from the Arab world who are working to build rights. But we’ve encountered a lot of problems. For the first time, we wanted to get support from the African Union commission so we could participate in the meeting they organized for African women. Unfortunately, we lost that opportunity. Eventually, we did get to participate in the activities that the UN organized for the International Women’s Day on the 8th of March. The theme was climate change and empowerment of rural women. It was very interesting because we could hear other voices, especially of rural women whose situation is very similar to ours and whose experiences are very important for us. B: Why do you think Western Sahara is not on people’s radar? F: I will start by saying that we have always been victims of information, of the media. All of the local media is controlled by Morocco. I remember in 2001, with the support of Spanish women, we visited three countries: Syria, Lebanon, and Jordan. We could meet a lot of groups, women’s groups, but nobody could talk about this visit in the media. I think the media is very important to create visibility. That’s what we need. B: There seems to be a case for autonomy of Western Sahara under Moroccan sovereignty. I’ve heard that it might be the best the kingdom may offer. What do you make of this idea? F: I think when we wanted our own country in 1975, it was so that we could have independence and the right to self-determination. I think what we really need is to have an opportunity to talk, to make our voices heard, even if the Sahrawi people are to be part of the Moroccan population. More than anything else, we need to celebrate having a referendum, which is the only way to help people express their needs. We don’t understand why the Moroccan king is frightened of the referendum. B: Why do you think? F: I think it’s because of what the result of this referendum might be. B: What is the likely result? F: I cannot know the result but all the Sahrawi people will accept the results of the referendum, even if it different from what they expect. Why doesn’t the Moroccan king let us celebrate the referendum? B: With regards to the question of nationhood, how does one convince the international community about Western Sahara? F: I think our case is not well known enough yet. I think we have to create our own media, because we cannot count on international media. This way we will be able to travel, make connections, and make ourselves visible. I think that’s what we need. B: What, according to you, is Morocco’s vested interest in Western Sahara? Do you think it’s an economic interest in phosphate reserves? Do you think it’s ethnic or cultural? What is it specifically that enables this particular relationship? F: I think it is because of our resources of petroleum, phosphates and fish that they are continuing to hurt our country. Morocco has a very big population, but very poor land resources. They think that Western Sahara has a very small population and a very rich territory, and they believe that we do not deserve this territory. They want to share it and take control of it. And, thanks to international interest in our resources, Morocco today has a very important agreement with European Union and with France. They are now fishing from our waters, from our coasts, illegally. This is why this agreement could not be renewed this year. Some European countries that are our friends brought attention to these illegalities. But now, since March, it seems that some of the other countries that are victims of the annulment of this agreement are trying to renew the plan. B: It seems that oil exploration in Western Sahara was not that successful. A few decades ago, Spain and a few other countries had set up oilrigs but that didn’t really work out. But now the focus is on phosphates? B: I find that, generally, in any kind of political history, a kind of narrative is built up, and once that narrative has been decided, it becomes impossible to change it. It becomes harder and harder to go back in time and try to really figure out what exactly happened or why things happened. Most narratives about Western Sahara claim that the main rupture took place in 1975. That’s when this situation was born. Do you agree with that as a starting point, or do you think there were some pivotal moments before that which led to where we are now? F: When we talk about 1975, it means we are talking about the birth of our relationship with Morocco. But the problem did not start at that time. It started before that, with Spain. Western Sahara was a Spanish colony from 1884 to 1975, and in this period the Sahara’s case had been made in the UN because the idea of a referendum was proposed to Spain before that time. But Spain, instead of celebrating the referendum, decided to leave the land in another way, and to leave the land to another power with which Spain could share the responsibility and the benefits. 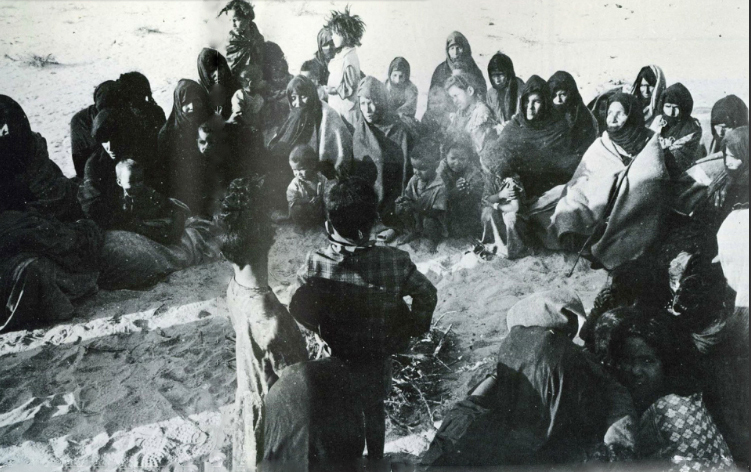 We had a very important moment in our history in 1970, which was when the Sahrawi revolution started. It got visibility as a revolution because of our leader, Muhammad Bassiri, who was subsequently disappeared and has not been seen to date. Spain had to leave, not because they wanted to leave. It was because of the Sahrawi revolution that began in 1970. The proclamation of the Polisario Front happened in May of 1973. Even the name Polisario is a Spanish word, not an Arabic word. B: Do you feel that historically Western Sahara, because of its location and the way it’s been sandwiched between many big powers, has always been a place where violence has been a part of daily life? 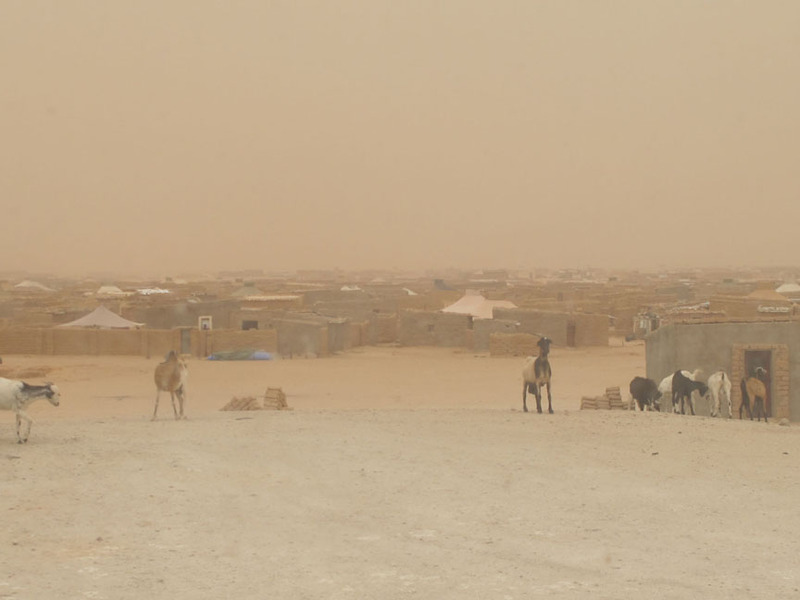 Has Western Sahara known an existence without violence? F: In fact, when we think about our history, our past, we can only think about violence because we lived this violence with Spain. And even before Spain, there were other forces, like France and Portugal, which tried to invade us. Before Spain, there were Morocco and Mauritania. When we think about our past, we can only find violence, but I think it is precisely this condition that makes one realize that what is important is peace. But unity also becomes very important. I think we have very solid social values, due to which we have been able to survive all of this violence. B: In my research, I have found that when a place experiences a lot of violence over a long span of time, and even when its people finally achieve the statehood that they want, they are not able to achieve peace. Violence continues to afflict such a space. This is one of the biggest problems when you think about so many African and Asian civil wars after colonialism. Do you think Western Sahara will fall into that trap? What does an independent state of Western Sahara look like, and what will happen to all this legacy of violence? F: When the Polisario Front decided to proclaim the nation-state, even while they’re still fighting, they also want to emphasize that this is a movement, a political movement. Now we have the two systems. We are a movement, but also we are a nation-state. The objective is to try to build and construct our nation-state while we are fighting to get independence. And that is also why, as women, we are trying to reconstruct our new society. We aren’t only dealing with the problem of managing and securing peace, but also with the process of improving human rights and women’s rights after the independence. B: In the history of revolutions and freedom movements, women’s participation and involvement is pivotal. But once the revolution dies, women tend to be left out of the history and they are pushed into traditional roles as if they never actively participated in the history. 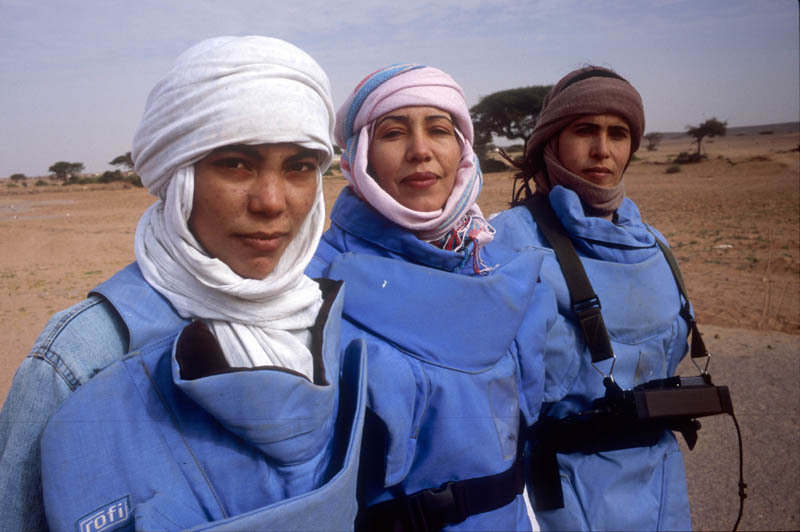 Do you feel that with the way you have structured the movement and the way in which the women of Western Sahara are mobilizing that you might be able to avoid this category? F: In 1991, when the peace process began in Western Sahara, this was one of the very important issues that we discussed as women. Until that time, women were alone in the camps and had gotten a lot of responsibility as leaders. But after that, because of the ceasefire, the men returned to the camps. They stayed in the camps much longer than before. This new situation showed us that our progress was threatened and we started to organize a discussion space between the women in the camps, and also with other women all over the world, to reflect on our experience. And we discussed how to be the pillars of the resistance, and how to guarantee our participation and involvement in our future independent state. I think it was our biggest achievement during the peace process period. We agreed to rebuild our strategy and tried to change our roles in the society because we were responsible for all the activities in the camps. We have a lot of social assistance, education and health programs. But we have not had enough time to dedicate to very important issues like women’s rights, leadership, and empowerment. In that moment, we also decided to improve our participation in the government, to build a special ministry for social affairs, and to also improve our participation in the parliament. We built spaces for women in all the camps, and offered them the chance to participate in training for service teams, leadership, empowerment and communication, and to reinforce and build capacity within them for now and for the future. B: You spoke a little bit about having solidarity with women across the world. Do you feel there is a tension between the way Western feminism and Western women engage with the struggle of the women from marginalized, poorer, more religious or traditional societies? F: I think the relationship between the two is very tense, partially because there are a lot of problems that women experience across the world. That means we need to create ways to organize all the women. When we go to international forums where women are talking about domestic violence, we feel uncomfortable when we want to talk about self-determination. F: Because they are not seeing that there is another problem, another big problem for women. They are suffering from one problem, and do not have the space to hear ours. B: Are you implying that it is a lesser problem or you are just saying there is no space? F: For other women, domestic violence is the biggest problem. In this case, they are forgetting other groups who are still struggling with another issue, maybe a more fundamental one. We [first] need to have a place where we can live. We need to be recognized as human beings before talking about violence towards women. B: So the Polisario have recently been accused of collaborating with Al-Qaeda in the Islamic Maghreb (AQIM). Your response? Fi: I cannot believe this! Not just Polisario, but our movement in general is trying to introduce ideas like women’s rights, human rights, and democracy. That’s why, as a movement, we are not welcomed by a lot of Arabic and Islamic groups. They think that we are breaking the rules of Islam; for example, in my society, there would be no problem if I were to shake hands with a man. This, for certain Muslims, is a very big sin. Also, there is an opposition to our relations with Europe, with another religion. In the camps we welcome contact with other religions and religious dialogue. Al-Qaeda is against all of these ideas, and because of this, we cannot have any relation with Al-Qaeda. I think there are other groups that are trying to fabricate the connection between terrorism and Polisario. I will give you another example. We have a very beautiful program called Vacations of Peace. We send our children – around ten thousand Sahrawi children – to spend their summer holidays with families in Spain, in France, in Italy, even in United States. All these groups are against such initiatives, while we are very open to other cultures. B: Are people in your region feeling the effects or echoes of the Arab Spring? F: I think in my country, we know that the Arab Spring didn’t start in Tunisia. But even if all the people in the world think it started in Tunisia, this kind of struggle, this kind of voice, is very important for us. They are trying to make visible all the things that we have been working on. B: Which are the specific struggles that are going on now in the world that you, from Western Sahara, identify with in a more special way? F: I would say the experience of South Africa and Namibia. I think we share the same kind of foreign invasion and a lot of similar problems. For example, Morocco has now invested a lot of money in Western Sahara and cannot [simply] leave it. The British had made a lot of money in South Africa, and finally they had to leave it. The movement of ANC (African National Congress) or the movement of SWAPO (South West African People’s Organization) of Namibia started much like our movement. B: Morocco has now actually built a wall. Can you tell me a little about the wall? F: It’s a very large wall that runs from North to South. It is 2,700 kilometers long and divides the territory between two parts. There are a lot of military groups along the wall and millions of landmines. It is one of the largest landmine fields in the world. There is no access from the inside to the outside, or vice versa. The idea comes from Israel. It is basically a kind of weapon against the nomadic Bedouin people, especially women and children. If they ignore the landmines, the children start to play with them, and there have been a lot of victims. Also, it becomes impossible to get water from the land, since it’s dangerous. People have also lost their animals. The nomads’ animals cannot be controlled, so they end up dying. Now the United Nations is trying to organize visits between the camps and the occupied territory to unify families separated by the wall. It’s a very small program, and very few people can benefit from it since it depends upon a tiny plane that takes them across. This is not the right approach, because if they can annihilate the wall, there is no need to invest a lot of money to make trips by plane. But they do not want to do that. B: We know that conflicts destroy family life. Can you tell me a little bit about the impact it’s had on your family, when you were small, and then on your children? F: My story is not the worst of stories. My family is one of those families who left for another part in the occupied territory. I have aunts in the occupied territory, though I have only heard their names. I’ve never seen them. B: Your children are with you now? F: No, they are studying. There is only primary school in the camps. And after that, they need to be sent to another country to continue their studies. My family, it’s like a small planet. Some members speak Spanish, and others only Arabic, and others only Spanish. Some of them have Sahrawi culture, others European culture. I think that’s the situation of the Sahrawi society. It’s a society where all the cultures have come to be included. There are students who were studying in Europe or Latin America, and we have a lot of our students who are studying in Cuba. Cuba was one of the countries who began supporting the Sahrawi people in the seventies. I think all these things can be very important things to make the Sahrawi society a very rich society. F: It’s very difficult, and it’s very bitter when you know that my grandmother and my mother, their life was very difficult. I am now adding my story to theirs. For me, that’s a very dark side of our history. But my worry is not my life; my worry is the life of my children and their children. This gives me the strength to fight – to enable them to someday have another kind of life. Bhakti Shringarpure is the editor of Warscapes. Posted on April 25, 2013, in Feminism and tagged Morocco, POLISARIO, Western Sahara, Women's Rights. Bookmark the permalink. Leave a comment.